Before Labor Code section 925, when out-of-state employers had full-time employees that live in California, the employers would often incorporate choice-of-law or venue selection provisions into employment contracts. Employees had to agree to these provisions as a condition of employment. The choice-of-law or venue locations typically had labor laws that were more favorable to the employer than California’s labor laws. For example, California law prohibits employers from requiring employees to waive their right to a jury trial before a dispute arises and also places significant limitations on arbitration agreements. California law also requires the reimbursement of certain business expenses, but many other states do not. Some out-of-state employers used choice of law or venue provisions simply to have uniformity throughout the company workforce and to create some litigation predictability. Labor Code section 925 severely limits this practice. Many employment contracts include arbitration provisions as a means of resolving any disputes. California Labor Code section 925 expressly defines “adjudication” to include both litigation and arbitration. However, the Federal Arbitration Act preempts state laws, so an employer might be able to include an enforceable arbitration provision if the arbitration clause is governed by the Federal Arbitration Act. What should an employee do if faced with a choice of law or venue provision in an employment agreement? • In reality, this is a sensitive issue. Employees are reluctant to point out issues in their employment agreements at the risk of the job offer being retracted. Of course there are potential legal remedies available to employees who are retaliated against for enforcing their rights under Section 925. But there are also economic realities of needing to receive a paycheck sooner as opposed to later or after a legal battle. The best advice is to consult with an attorney to consider your options. Review their standard employment agreements and boilerplate language regarding venue and choice of law, revising them for future use with California-based employees. Include an acknowledgment that the employee was independently represented by counsel in negotiating his or her employment agreement (and have the lawyer for the employee execute the acknowledgment as well). 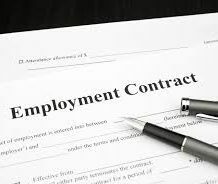 Review current or pending employment contracts and determine (1) if they contain choice of law or venue provisions and (2) if they do, extend the contracts before the end of the calendar year, before section 925 takes effect.